Show that special someone that you think you are a perfect fit with this awesome interlocking pendant set. A cast sterling silver version of everyone's favorite building toys. The best part is, it still works! The plastic bricks were each hand cast using the lost wax method. We burn out an actual brick for every piece, destroying the original. 1 plastic brick = 1 silver brick. This listing is for 2 of my 2X2 Building Block pendants (with tab) that have been created to fit together. When stacked, these pendants form a sweet little heart. One to keep and one to give! The pendants measure approximately one inch long and are 5/8 inch wide. 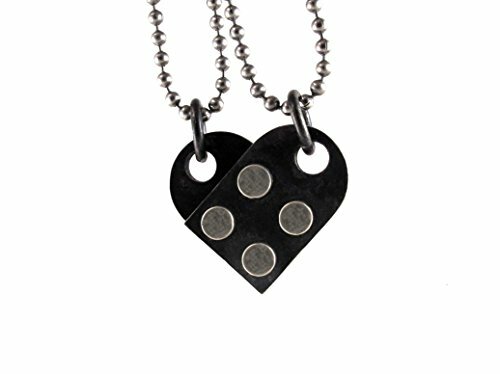 They each hang from a 20 inch stainless steel ball chain. I gave the pieces a black patina and then brushed it back to better highlight the "studs". The silver bricks work with all major brands of the plastic bricks, so you can mod out your jewelry to suit your mood. If you have any questions about this product by rubygirl jewelry, contact us by completing and submitting the form below. If you are looking for a specif part number, please include it with your message.